I’ve been racking my brains for an SFFnal subject to write about for this month’s column, but the truth is, I’m preoccupied. It’s playoff season for the NHL, and now that I’m deep in ice hockey fandom – which is to say, investing emotionally in an Actual Sport – a significant portion of April is necessarily devoted to yelling about armoured men in knife shoes squabbling over whose turn it is to drink champagne out of a blinged-up birdbath. The thing about competitive team sports, it turns out, is that they’re an ongoing human drama. 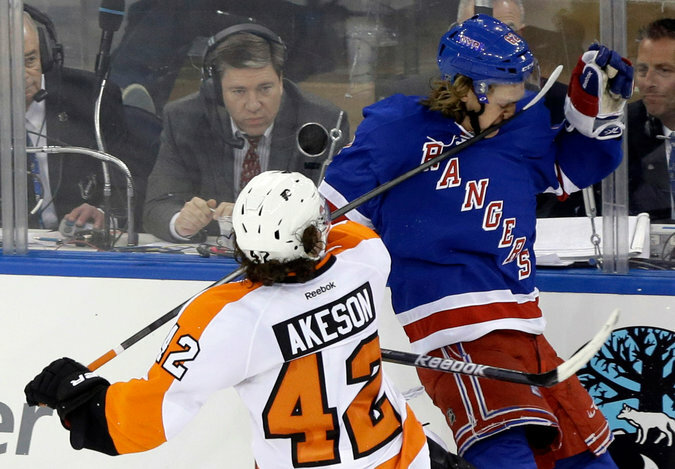 It’s like unscripted reality TV with genuinely high stakes – and in the case of North American ice hockey, it’s also a fascinating mix of the violent, the sublime, and the ridiculous. Take, for instance, the playoffs tradition of throwing octopus on the ice in Detriot – formally referred to as the Legend of the Octopus – which has since spawned a sister tradition of throwing catfish on the ice in Nashville. During last year’s playoffs, a Nashville fan was ejected from the Pittsburgh arena for smuggling a catfish into enemy territory and throwing it on their rink, a shenanigans-style escapade that involved the man in question hiding the fish in his underpants in order to sneak it in. I could happily write an entire critical essay about politics and political engagement in the NHL – and perhaps I will, someday. But that will require me to put on my Serious Hat, and right now, I’d much rather flail enthusiastically about my general love of fighty ice chess. But even so, SFF tends to be very careful about distinguishing warriors from athletes, even in stories where martial combat is held as a sport: a divide that makes a degree of sense when it comes to something like jousting or chariot racing, but much less so in any setting where gladiators are professional fighters. While it would be easy to write this off as nothing more than an extension of the same historical Nerd/Jock tension that makes sport of any kind a comparative rarity in SFFnal settings, I’m inclined to think it’s a little more complex than that. Given the ubiquity of a certain reductive faux-Medieval template throughout the fantasy genre, there’s a tendency to elide the sporting traditions of non-Western cultures when drawing from human history. Modern lacrosse, for instance, is ultimately derived from a number of ball games played by First Nations peoples throughout North American history, while the Mesoamerican game of ulama has similarly ancient origins, but neither of these is common fantasy fodder. Compared to stories about wargames and gladiatorial contests, anything resembling modern sports seldom rates a mention. Futurama’s blernsball and Red Dwarf’s zero-G football are counterexamples, but these function more as recurring jokes than anything else, with both serving as clear, humorous what-ifs about the future of existing sports (respectively baseball and soccer). The more intriguing examples, I would argue, are found in urban fantasy settings: the Quidditch of Harry Potter, the Welters of Lev Grossman’s The Magicians, and the blitzball of Final Fantasy X, which takes place in a sort of techno-magical secondary world. Though all three settings are wildly different, what strikes me as significant about their respective sports is that, in contrast to the majority of modern team sports, men and women compete both together and against each other – something that is also true of Kate Elliott’s Fives and batey. True, there are plenty of SF stories about virtual games and sports, which often do a better job of portraying mixed gender teams – John Scalzi’s Head On springs to mind, though I’m yet to read it – but I’d argue these narratives are, in a fundamental way, thematically different to stories which centre on sports conducted in the flesh, if only because they feel so intrinsically tied to that ancient Nerd/Jock distinction. In geekish contexts, the schism goes so deep that it’s practically a form of Cartesian dualism: no matter how action-oriented, team-based or sportslike a virtual game might be, it remains a pursuit of the mind, because the ultimate fantasy is still primarily one of intellectual strength; whereas actual sports, when explicitly written as real-world activities undertaken by fit, athletic individuals, is rather a fantasy of physical strength. That female athletes in both types of SFF narrative are more readily credited with the ability to compete in violent, aggressive contests against each other and/or alongside men than they frequently are in real life is, I would argue, a primary aspect of their appeal for many readers. In the real world – and in stories more lazily extrapolated from it – we still have to deal with the overwhelming sexism of sports culture. Returning to modern ice hockey, a major difference currently between the men’s and women’s games – besides the traditionally stark divides of pay, publicity, respect and league size, heyoooooo – is the supposed lack of physical play. Technically, body checking was banned for women in 1990 for seemingly no reason other than official (read: male) discomfort with women engaging in rough physical contact, despite the fact that the women themselves petitioned to be allowed to play that way. Fighting, likewise, is completely against the rules. Regardless of this, however, such contact still happens in women’s games – checks are just reclassified as “collisions,” with penalties doled out to too-blatant offenders. Even fights still happen, as per the magnificent line brawl that took place during a USA-Canada match at the 2018 Winter Olympics (to pick just one example). Demonstrably, women are both willing and able to play aggressive, fast-paced, physical sports in the real world, which is why I find it so frustrating on those occasions when SFF stories choose to view our current sexist defaults as universal, even for the sake of comedy. Yes, Futurama’s blernsball episode, A Leela of Her Own, was meant as a direct reference to the 1992 film A League of Their Own, which chronicled female baseball players struggling to find legitimacy and acceptance as athletes in WWII America, but it’s nonetheless telling that a show set in the 31st century used “first female athlete in the major leagues” as an uncritical plotline. All that being so, it’s my hope that we start to see more SFFnal depictions of women in sports both real and invented. As much as I love ice hockey, it’s frustrating to see the women’s game limited by sexist perceptions of female competence – though as demonstrated by Brian Boyle’s utter delight at Hilary Knight’s cameo at the 2018 NHL All Star weekend, some male players, at least, are wise to the truth. 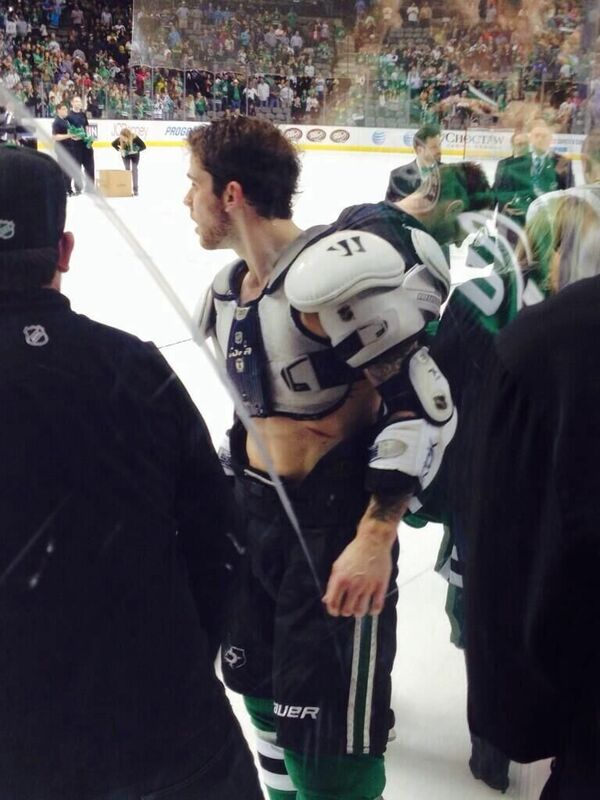 Tyler Seguin posing for the ESPN body issue.